Brazilians offer mixed views about the way things are going in their country. Most say the nation’s economy is in good shape, but concerns about illegal drugs, crime, corruption and social inequality are widespread. Still, compared with other publics around the world, Brazilians are among the most satisfied with national conditions. Of the other 21 publics included in the 2010 Pew Global Attitudes survey, only the Chinese express more positive views of the way things are going in their country. An overwhelming majority of Brazilians gives the government good ratings for the way it is handling the economy, and many expect economic conditions to improve over the next year. Yet, a large percentage of those who say the country’s current economic situation is bad blames the government primarily; many also say Brazilians themselves are responsible for the country’s economic troubles. When asked whether they are satisfied or dissatisfied with the way things are going in their country, Brazilians are nearly evenly split: 50% offer a positive assessment and 49% offer a negative view of their country’s direction. Still, the only nation surveyed where views of national conditions are more positive than in Brazil is China, where 87% are satisfied with the way things are going in their country. Brazilian men are considerably more likely than women in that country to say they are satisfied with the way things are going; 56% of men offer a positive assessment of national conditions, compared with 43% of women. Satisfaction with national conditions is also more widespread among the less educated. Nearly six-in-ten (58%) of those with no more than a primary education are happy with the way things are going in the country. In contrast, 45% of those with at least some secondary education and 49% of those with some college or more offer positive assessments of national conditions. Respondents in rural areas are much happier with the state of the nation than are those in urban areas. A majority (62%) in rural parts of the country say they are satisfied with the way things are going, while 36% say they are dissatisfied. Those in urban areas are nearly evenly split; 48% are satisfied and 50% are dissatisfied with national conditions. Regionally, those in the Northeast are especially inclined to express satisfaction with the way things are going in Brazil; about six-in-ten (61%) say they are happy with national conditions while 36% say they are not. Views are more mixed in the other regions of the country. For example, 45% in the Southeast say they are satisfied with the way things are going in their country, while 53% say they are dissatisfied. Of the 22 publics surveyed, Brazilians offer the second-most positive evaluations of economic conditions in their country. A solid majority (62%) describes the current economic situation in Brazil as very or somewhat good, while just 36% say the economy is bad. China, where 91% rate their country’s economy as good, is the only country where views are more positive than those of Brazilians. 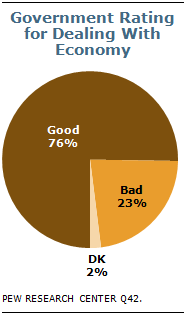 Majorities in 17 of the 22 nations surveyed say their countries’ economies are in bad shape. Men and those with at least some college education give Brazil’s economy particularly high marks. While nearly seven-in-ten (69%) men say economic conditions are good, a narrower majority of women (56%) share this view. Among respondents who have attended college, 70% give the economy a positive rating, compared with 62% of those with some secondary education and 59% of those with a primary education or less. Ratings of economic conditions do not vary significantly across income or age groups.2 Respondents in all regions also offer similar evaluations of Brazil’s economy, as do those in urban and rural areas. Of those who think the economy is in bad shape, an overwhelming majority (80%) blames the government for their country’s economic problems. More than half (55%) say Brazilians themselves are among the top culprits, while 26% blame banks and other financial institutions for Brazil’s economic troubles. Few name the U.S. (5%) or the European Union (2%). Still, a solid majority of Brazilians (76%) give their government a good rating for its handling of the economy; just 23% say the government is doing a bad job. This view is prevalent across demographic groups and regions. Even among those who say the economy is in bad shape, more give the government a good rating (51%) for its handling of the economy than give it a bad rating (46%). And those who blame the government for the country’s economic troubles are divided – 49% say the government is doing a good job on the economy and 50% say it is doing a bad job. Brazilians are optimistic about their short-term economic future. Three-quarters say they expect their country’s economic situation to improve over the next year. 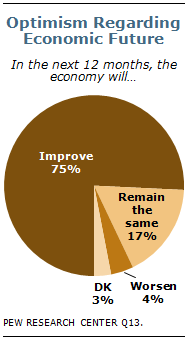 Just 4% say the economy will worsen, while 17% expect it to remain the same. Among those who rate the current economic situation positively, 80% expect it to be even better in the next year, while 16% expect it to remain the same; just 2% say things will get worse. Optimism is less widespread among those who say the economy is currently in bad shape; still, 68% in that group expect economic conditions to improve in the next year, while 21% say things will remain the same and 9% think the economy will worsen. An overwhelming majority of Brazilians (87%) say that growing trade and business ties between Brazil and other countries is a good thing. This view is widespread across demographic groups and regions, but those with some college education and the more affluent, as well as those in urban areas, are somewhat more likely than the less educated, those with lower incomes, and those in rural parts of the country to say growing trade is good for Brazil. Brazilians also support the free market approach. Three-quarters agree that most people are better off in a market economy, even though some are rich and some are poor; 21% disagree with this view. 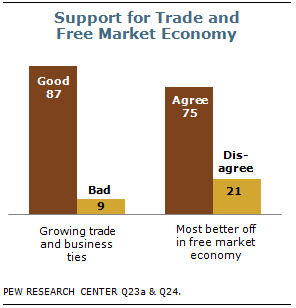 By comparison, fewer than half in the other two Latin American countries surveyed endorse free markets; 44% in Mexico and 40% in Argentina agree that most people are better off in a market economy. More than eight-in-ten Brazilians say illegal drugs (85%) and crime (83%) are very big problems in their country. Large percentages also see corrupt politicians (79%) and social inequality (66%) as very big problems, while somewhat narrower majorities express similar concern about pollution (62%), the spread of HIV/AIDS and other infectious diseases (58%) and economic issues (53%). 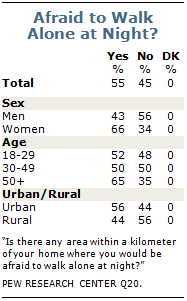 Relatively few (27%) say access to drinking water is a major problem in Brazil. 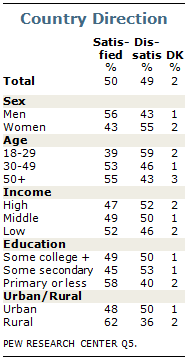 For the most part, views of national problems vary little, if at all, across demographic groups. However, those in rural areas are often more likely than those in urban areas to characterize Brazil’s challenges as major. For example, 75% of respondents in rural parts of the country describe the spread of infectious diseases as a very big problem, compared with 56% of those in urban areas. And while about three-quarters (74%) in rural areas say pollution is a major problem, 60% in urban areas share this opinion. Blacks are more likely than whites and those who are of mixed race to see social inequality as a major challenge. Nearly eight-in-ten (77%) blacks describe social inequality as a very big problem in Brazil; 68% of those of mixed race and 63% of whites do so. Brazilians across income and educational groups offer similar views about the extent to which social inequality is a problem in their country. More than half of Brazilians (55%) say there are areas within a kilometer of their home where they would be afraid to walk alone at night; 45% say they feel safe walking alone in their neighborhood. Women, those over 50 and those who live in urban areas are especially likely to feel unsafe. About two-thirds (66%) of women say there are areas near their homes where they would be afraid to walk alone at night, compared with 43% of men who say that is the case. Among those 50 and older, 65% say there are areas within a kilometer of their homes where they would be afraid to walk alone at night. By contrast, half of those ages 30 to 49 and about the same share of those younger than 30 (52%) feel unsafe in their neighborhoods. And while solid majorities of urban and rural dwellers describe crime as a very big problem in Brazil (83% and 87%, respectively), those who live in urban areas are more likely to feel personally unsafe. More than half (56%) of respondents who live in urban areas say there are parts of their neighborhood where they would be afraid to walk alone at night; 44% of those in rural areas say that is the case.